This is an eerie tale, a low budget black and white movie which deservedly enjoys cult status. Some youngsters out cruising in their car have a race but one of the cars plunges off a bridge and disappears into the river below. The police have little luck when they try to find survivors but then suddenly Mary (Hilligoss) appears standing on a sandbank looking dazed. 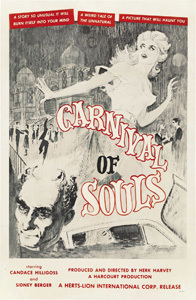 She takes a job as a church organist in Utah but on the journey she sees a strange disfigured man who continues to haunt her in her new life, she also feels strangely drawn to the abandoned carnival just out of town. This is a slow moving and effective chiller which will haunt you after viewing if you give it the chance. The premise has been copied many times and this was clearly an influential horror film.